MIAMI, Feb. 7, 2019 /PRNewswire-HISPANIC PR WIRE/ — Leyda E. Bowes, M.D., Marilyn Zabielinski, M.D. and the medical team at Bowes Dermatology by Riverchase are proud to announce the availability of a revolutionary, minimally invasive facial lifting procedure, Silhouette InstaLift® at Bowes Dermatology by Riverchase. Silhouette InstaLift® is the only facial rejuvenation treatment with a unique dual action that lifts the mid-face and adds volume for a naturally lifted look. The procedure helps increase volume while restoring the contours of the mid-face and cheek areas gradually and naturally. The Silhouette InstaLift® gives both men and women a safe and effective solution to reverse facial sagging without surgery. During this minimally invasive, in-office procedure, the physician lifts the deeper layers of the skin with an innovative cone technology. The treatment takes approximately 45 minutes under local anesthesia, and unlike facelifts of the past, there is minimal downtime. “Silhouette InstaLift® is a wonderful non-invasive, quick in-office procedure to address skin laxity that occurs with aging. It instantly lifts and stimulates collagen production over several months, so the results are not only maintained, but improve over time. It’s an excellent complement to fillers and Botox, too,” says Dr. Marilyn Zabielinski. The Silhouette InstaLift® technology is made from glycolide/L-lactide (PLGA), a biomedical copolymer that is well tolerated by the body. Over time the sutures will naturally be absorbed by your body while stimulating production of collagen to aid in healthy skin renewal for natural- looking, long lasting results. Results are visible immediately and improve over a three-month time span, with lasting lifting effects. We are pleased to be hosting an exclusive Spring Lift event on Thursday, March 14 with a live demonstration, VIP pricing and a raffle for all attendees. Space will be limited and will fill fast. Please contact our direct cosmetic line at 305.856.6519 to preregister. Follow us on Instagram @BowesDerm and Facebook at Bowes Dermatology for additional event details. 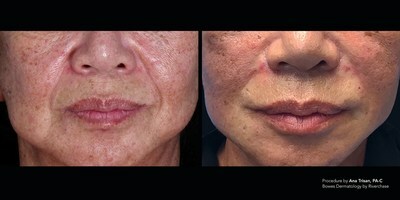 To schedule a complimentary consultation with our aesthetics specialists, please contact our direct cosmetic line at 305.856.6519 or visit our website www.bowesdermatology.com for additional information on this revolutionary procedure. Riverchase Dermatology and Cosmetic Surgery is one of Florida’s largest and most comprehensive skin centers. Founded in Naples, Florida in 2000 by Andrew T. Jaffe, M.D., FAAD, Riverchase has maintained its initial vision of providing the most comprehensive skin cancer, dermatology and cosmetic surgery services for over a decade. The caring and skilled providers at Riverchase use the latest techniques and equipment to diagnose and treat a wide range of skin disorders and cosmetic concerns. Riverchase has many convenient locations throughout Florida. For more information, visit www.RiverchaseDermatology.com. Next articleLatino Art Historian and Chef Receive Prizes Honoring Immigrants in U.S.